WHAT’S IT LIKE? The five-star Bellagio is a giant of a hotel – a faux-Italianate edifice wrapping around an artificial lake in front and overlooking clusters of turquoise pools, cypress trees and Tuscan-style walkways behind. It opened just over a decade ago at a cost of US$1.6 billion, claiming to have set the standard for luxury accommodation in Vegas. The hotel was extended in 2004, adding a US$375 million Spa Tower, 928 rooms and suites, 5,575 sqm of convention space, a restaurant and several retail outlets. By the end of last year, all the original rooms and suites were also renovated. The property is managed by the MGM/Mirage conglomeration of hotels and resorts, which is also developing the ambitious City Centre project on the Strip, due to open at the end of the year. Arrival by car takes you up a sweeping driveway around the lake to the entrance, where rows of limousines are parked and smartly dressed porters stand ready to open your door. The huge lobby has a bank of reception desks to the left with queues of people waiting to check in and out throughout the day. To the right is the casino and beyond that the lifts to the bedrooms, while at the far end of the lobby is a glass-roofed conservatory with a garden of 20,000 flowers. Facing on to this area are several of the hotel’s restaurants. The ceiling above the lobby is decorated with an explosion of giant glass petals in rainbow colours – a “chandelier” designed by US sculptor Dale Chihuly, whose pieces are also displayed in galleries around the world such as the Victoria and Albert Museum in London. As with everything in Vegas, the hotel can feel a bit overwhelming – as well as hundreds of guests passing through, there are countless visitors milling around, heading to the restaurants or gambling in the casino. The only way to escape the melee is to get to your room. WHERE IS IT? The property is located on the Strip (also known as Las Vegas Boulevard South), opposite the Paris hotel and casino with its imitation Eiffel Tower. 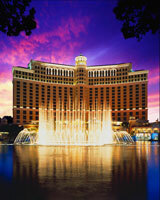 The Bellagio is hard to miss, especially when the fountains in front are “performing”. Every 15-30 minutes, 300-metre high jets of water pumped from the 8.5-acre lake in front of the hotel “dance” to music played from speakers. McCarran International airport is 6km away, just off the southern end of the Strip – it takes ten to 20 minutes depending on traffic. The hotel has free valet parking (although a tip is customary) as well as a free self-park option at the car park to the left of the main entrance up Bellagio Drive. ROOM FACILITIES Bedrooms vary dramatically in terms of the amount of space and amenities you get, with the best rooms often available only to “guests of the hotel” and therefore unbookable. However, even the lowest category rooms offer a selection of essential comforts such as good-size marble bathrooms with walk-in showers and tubs, well-stocked minibars (with everything from chocolate poker chips and Kodak fun cameras to Tattinger champagne and a martini kit), evening turndown service, and big, comfortable beds. My Bellagio King room at the back of the hotel overlooked the swimming pools far below, but although it had a floor-to-ceiling window, it was not very light. It was also closer to 30 sqm than 47 sqm, and I found that when it came to working, the workdesk didn’t provide much space to spread out on. The décor was pleasantly neutral, with soft fawn-coloured carpets and walls, cream and ochre marble, dark wood furniture, and abstract prints. Although many of the bedrooms have flatscreen TVs, the one in my room had not been updated from the old tube variety. Other amenities included robes and slippers, an iron and ironing board, electronic blinds and drapes, air conditioning and multi-line telephones. In-room dining, available 24 hours, provided a decent set of options plus the chance to order on-the-go boxed lunches from US$20. Higher category rooms offer all manner of upgraded facilities, such as whirlpool tubs, deluxe spa products, his and hers bathrooms, entertainment lounges, dining areas, wet bars and conference rooms. The Executive Suite lounge (7am-9pm) opened in January and offers guests private check-in, free boarding pass printing, internet, drinks and nibbles. RESTAURANTS AND BARS Eating and drinking options are plentiful – 18 in total – and some are of a very high standard indeed. Yellowtail Sushi restaurant and bar, which opened last year, is one of the newest offerings and serves modern Japanese cuisine. For an all-American breakfast, lunch or dinner 24 hours a day, Café Bellagio on the ground floor by the conservatory is a popular bet – and the queues prove it. The Jean Philippe Patisserie nearby has a chocolate fountain and sells tasty sandwiches, crepes and cakes to take away, while the two-Michelin starred Picasso (with original works by the artist adorning the walls) serves dinner daily, except Tuesdays. La Cirque has one Michelin star and specialises in French cuisine, while Michael Mina, next to Café Bellagio, also sports a Michelin star and offers an exciting international menu in the evening. The food at Michael Mina’s was a highlight, and the service was excellent, especially from master sommelier Joseph Phillips, who took time to talk through each of his selections. As well as the contemporary fish and seafood dishes on the main menu, the restaurant offers five-course seasonal and vegetarian tasting menus (US$78-US$85) with the option of wine pairings (US$48-US$78). The chef’s signature Osetra caviar parfait with Alderwood smoked salmon, crème fraiche and potato shallot cake to start was well worth the US$28 supplement, and went perfectly with a glass of chilled champagne. Other highlights were the celery veloute with apple curry dumplings, served with a glass of Domaines Schlimberger pinot gris, 2006, Alsace; the Maine lobster pot pie with a 2004 Philippe Colin chassagne-montrachet, Burgundy; and, according to my dining companion, the American Kobe ribeye steak, complemented by a glass of 2005 Volker Eisele cabernet sauvignon, from the Napa Valley in California. For late-night drinking head to the Bank nightclub or the Caramel cocktail lounge. Fontana bar is next to the lake and often has live music in the evenings, while the Baccarat bar gives guests the chance to smoke a cigar and watch the high-rollers at work. The Petrossian bar off the lobby has live piano music 24 hours, while the pool bar is open seasonally from 10am to 6pm. BUSINESS AND MEETING FACILTIES By the end of the year there should be a shuttle train connecting the convention centre at the Bellagio with the Monte Carlo hotel and the new City Centre development. Until then, it can be easily accessed through the front of the hotel beyond the main lobby, but be prepared to do a lot of walking as the corridors are long. The Bellagio has more than 20 meeting and conference spaces totalling over 23,000 sqm of space, including three ballrooms with a capacity for about 7,500 delegates in total, and venues such as an outdoor Grand Patio, two wedding chapels, and the Tuscany Kitchen – a TV studio designed for live cooking demonstrations. It can also be used for team-building activities, cocktail receptions and formal dinners. Also located in the huge conference area, which loops around the pool terraces at the back of the hotel (part original, part new extension), is a modest business centre open 6am-8pm during the week and 8am-6pm on weekends. It has three private rooms with PCs, courier services, equipment rental, fax machines and internet access (US$15 for 15 minutes). LEISURE FACILITIES The 6,000 sqm spa and salon and the 550 sqm gym are located in the new Spa Tower and, for a fee, guests can experience a wide variety of Zen-influenced treatments in one of 56 private rooms. The meditation room, dimly lit with water running down the walls, can be hired by groups. Access to the spa (open 6am-8pm) costs US$25 per day, while access to the fitness centre is US$15-20 per day. The five outdoor pools are free for guests to use. While the gaming facilities here are a given, the Bellagio is keen to promote alternative forms of entertainment on its premises. If you do fancy a flutter, there is a large casino floor with everything from blackjack, roulette and craps to baccarat, slots and sports betting. 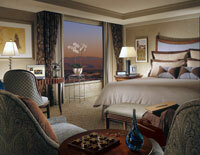 However, the décor feels fairly staid – not as fresh or contemporary as in some of the other casinos on the Strip. Minimum bets are usually US$5 during the week for table games, going up to US$10 on Fridays, Saturdays and Sundays. There is also Club Privé, the Bellagio’s high-limit lounge, and a world-renowned poker venue – host to the World Poker Tour and Bobby’s Room, a high-stakes poker room, which has a minimum buy-in of US$20,000. As well as an indoor shopping pavilion, there is an on-site gallery on the ground floor housing changing exhibitions of about 30 works of art. “Classic contemporary: Lichtenstein, Warhol and friends” is on until September 7. Entry is US$15 and includes an audio guide. If you want to catch one of Vegas’s famous shows, the Bellagio has twice-nightly performances of Cirque du Soleil’s resident show “O” (7.30pm and 10.30pm, Wednesday-Sunday). The theatre was specially designed and features a stage that doubles as a swimming pool – the cast of trapeze artists, acrobats, contortionists and pyrotechnicians perform vertigo-defying dives and surreal choreographed underwater dances. Tickets cost from about US$100 but it’s a spectacle you will never forget – I was blown away. VERDICT A top-class hotel that is determined to maintain its reputation as one of the most luxurious hotels on the Strip. 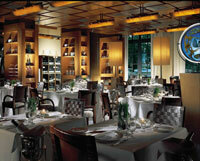 The spa is excellent, the dining options superb, and the meeting and business facilities extensive. ROOM HIGHLIGHTS The good-sized bathroom, comfortable bed and generously stocked minibar. PRICE Internet rates for a midweek stay in July started from US$166 for a Deluxe room.